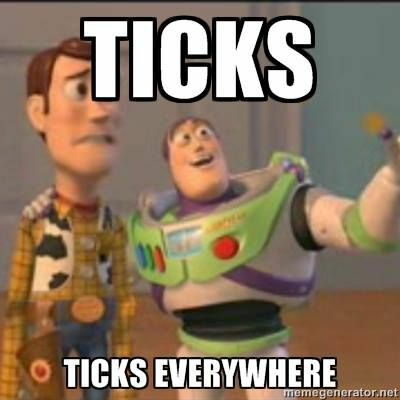 As we all know, with spring comes tick season. And many need to be reminded to take precautions to remove ticks soon after returning from outdoors, in order to avoid the increasing number of serious diseases ticks can transmit. The most informative, scary, and unnerving video clip I've seen on ticks was just published by San Francisco's PBS station. It certainly motivated me. People need to be reminded to remove them? When I find a tick, removing it immediately becomes the top priority in my life. Well I contracted Lyme Disease about 20 years ago....and never saw the tick; only the red bulls-eye a month later. Just as the KQED video clip predicts, the small tick must have been securely fastened for a couple of days, and then dropped off unseen. My mistake was that I was sleeping out, and didn't change clothes or take a hot shower for several days after long O runs in Wisconsin...known to be virulent deer tick country, with seasonal Lyme outbreaks even then. As we discussed last year, the list of new insect-borne diseases is rapidly increasing because of Global Warming. Here's a CDC list of diseases currently known to be carried by ticks in the US.